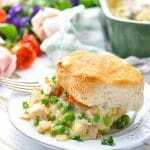 Sometimes you just crave down-home comfort food, and this Dump-and-Bake Southern Chicken Casserole does not disappoint! It's an easy dinner that comes together in about 10 minutes, for a simple and satisfying one pot meal that the whole family can enjoy. 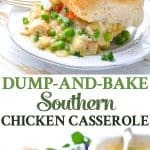 Sometimes you just crave down-home comfort food, and this Dump-and-Bake Southern Chicken Casserole does not disappoint! It’s an easy dinner that comes together with about 5 minutes of prep, for a simple and satisfying one pot meal that the whole family can enjoy. 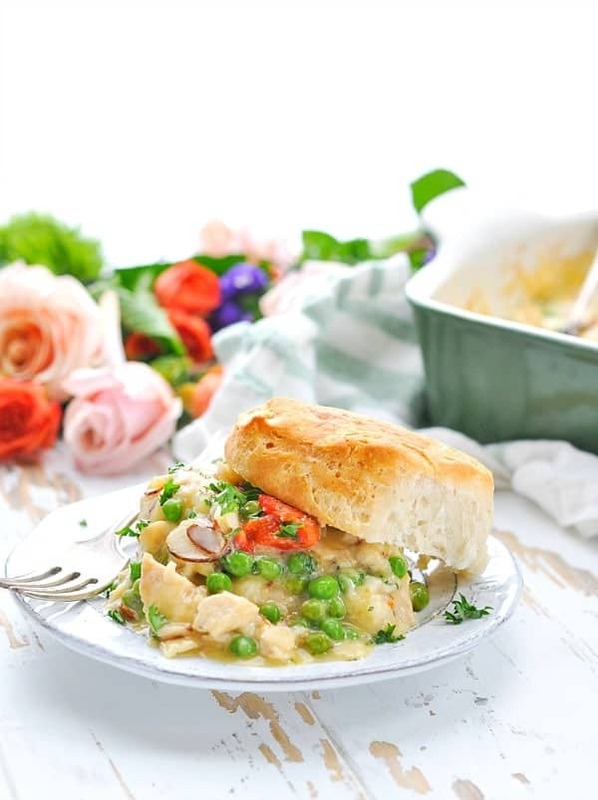 I like to think of this chicken casserole as a simplified version of Chicken Pot Pie — without the crust. Best of all, this is a chicken casserole that only requires a few minutes of hands-on time, since you’re just stirring everything together in one dish. It’s a dump-and-bake meal that makes life EASY, and nobody at your table will ever guess how quickly it came together! 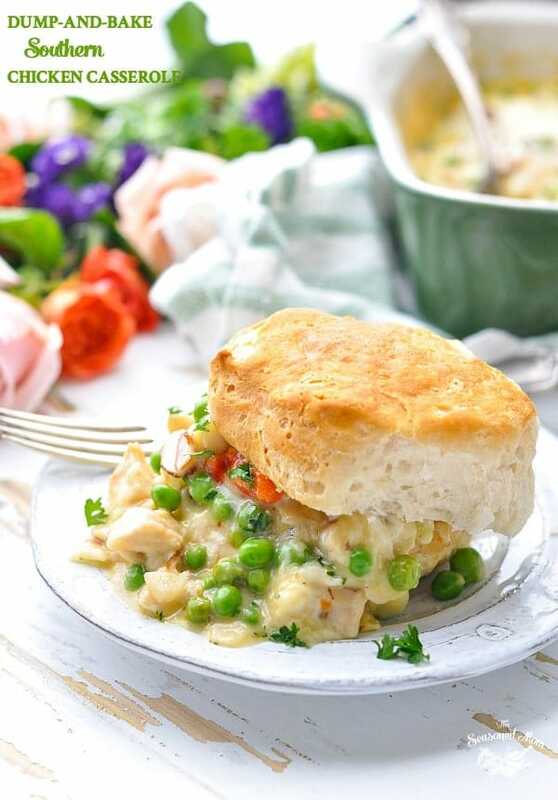 While you can certainly just enjoy the Southern Chicken Casserole on its own, I like to serve it piled high on top of warm biscuits (remember…it’s like a chicken pot pie filling?! ), with rice, or with dinner rolls. 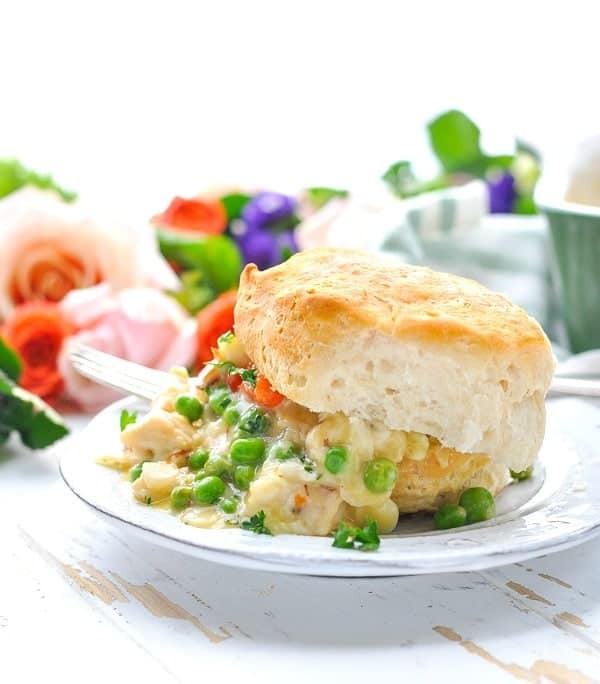 The biscuits work particularly well because you can just pop open a can of your favorite refrigerated biscuit dough and bake the biscuits in the same 350-degree oven, right alongside your casserole. It’s the perfect (easy) way to round out a simple and cozy Southern supper! Preheat oven to 350 degrees F. Spray a 2-quart (8-inch square) casserole dish with cooking spray. 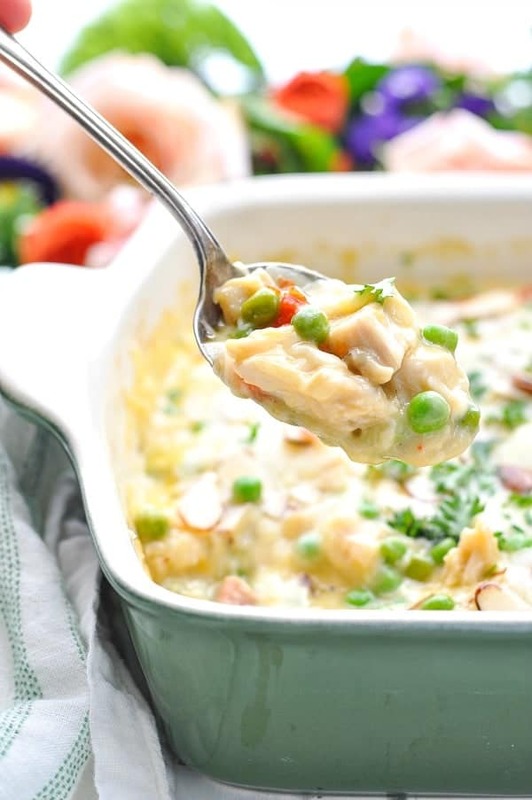 In the prepared dish, stir together chicken, Worcestershire sauce, cream of chicken soup, milk, ½ cup of the Swiss cheese, frozen peas, pimientos, and ¼ cup almonds. Season with salt and pepper, to taste. Cover. Bake at 350 degrees F for 35 minutes, or until warm. Remove cover, sprinkle top with remaining ½ cup of cheese and ¼ cup of almonds. Return casserole to the oven and bake, uncovered, for 5-10 more minutes (or until hot and bubbly and the cheese is melted). Serve over hot biscuits, with cooked rice, or with dinner rolls. Cooking Just for Two? Cut the ingredients in half and bake the casserole in a 1-quart dish. The cooking instructions remain the same; however, you can probably decrease the overall cooking time to about 35 minutes (the smaller dish will heat through a bit faster). This looks like serious comfort food. Yuuumm! This looks fantastic, how would I go about freezing this meal and cooking at a later time? Thank you! Hi, Nicole! I think that you could do it either way — you could assemble it and freeze it BEFORE baking, OR you can bake it and freeze the leftovers for later. If you’re reheating an already-baked casserole, I would keep it covered and bake at 350 degrees F until warmed through (probably about 30 minutes). If you’re serving it with biscuits, you can definitely bake the biscuits in advance and then freeze the biscuits until ready to use as well. Enjoy!